The handling is easy and fast. Very easy to use... You'll master it very quickly!! It isn't very rugged and you'll immediately feel that you can't abuse it like a wah. Nevertheless mine is 3-4 years old and it is still working!!! It's a small multi-FX for beginners and I don't use it anymore. The main con is its retro luminescent display!!! MGR/Mike Chalut's review"Korg AX1G Tone Works"
MGR/Anthony Johnson, Jr. - Sylvester, Georgia's review"Korg AX1G"
MGR/Encia's review"Korg AX1G Multi-Effects Pedal"
Bought it on Musician's Friend, for $100 plus shipping. I bought it about 9 months ago. I never had a multieffect before so I decided to buy one. It's a good pedal for the price. As in Chorus, Reverb, Etc. it sound pretty well. It's a good pedal but you will certainly need to buy a distortion pedal if you to hear good distortion. The wah sounds exactly like my Cry Baby 535Q with the Q and bandwith to the max. I would recommend the pedal for begginers. I'm still using it as main pedal since I don't have another one. But I think I'll get a new one this christmas. But the overdrive is super weak. Distortion sound too digital. Never had a problem. But well, it's plastic. It could suffer damage. for begginers or for fun. MGR/Matthew Rehm --- http://come.to/hext 's review"Korg AX1-G"
I bought this pedal from X-electrical in Kingston, Surrey, London, UK. I bought it because it has some really nice effects for its price. I bought it second hand mint condition, without box or manuals for £75. I really like this unit because it defines truly useful guitar effects at the touch of a few buttons, some are used by the cream of the music industry today. 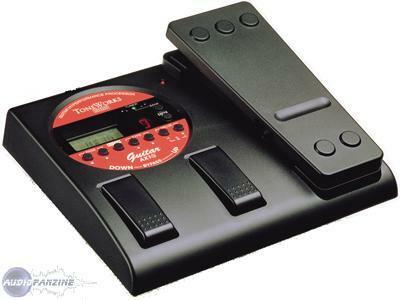 Every effect is editable, from the use of the pedal to the name and what number setting the effect is.It even comes with a tuner, metronome, and mute function to shut up your strings when u need to. Distortion, echo, whammi, wha-wha, and ones that are undescribable unless you can hear them! The fact that the battery compartment doesn't like to be knocked, and apart from that its fine! The construction and quality is second to none, the whole look of the pedal is really nice. The best pedal for straight forward easy to use effects, utilised in a small attractive cheaply sold box! the reverb is a little aggressive in frequencies but sometimes it's the long reverbs ... but not the foot, it is clear! what's cool: compression sleazy, and I love the noise reduction: Super ... the equalization at large is quite handy. Sound editing is very simple, no need to be an expert to get to edit their own sounds. unbeatable value for money. highly recommended budget and / or beginners given the number of onboard effects. it is not pro stuff, but we have fun without any problems. purchased in the late 90s, was the flagship model of the time-in-class low price, many young guitarists of the time bought, it is the small but sufficient material to begin with. Everything has already been said! 2 buttons for forward and backward through the presets selected. Very easy to use. No major flaws in design. I just had a problem regarding the volume of output when I bypass the effect and have the direct sound of the amp. Indeed, playing to a reasonable level and bypassing the pedal, I find myself with a clear sound almost inaudible (at least not enough) and we see the diff direct level. Ultimately, we must create a preset sound clear, but hey, not that great anyway. the distos: Cold and a bit too sharp sometimes loaded ... But hey it's sometimes appropriate to certain contexts. Modulations: Chorus correct (not too hot either), pretty good Delays, Phaser / Flanger not bad but I'm not a fan of this type vraimment effect. The Wha / Voice box: Not too typed correctly but no more. In short, I bought it in 98 opportunities to broaden my sound design. It served me well although I have not been used since the qq months. Still a good little cheap pedal for those who want to learn guitar and / or discover the types of effects that exist.